I grew up on White Castle sliders for the most part. I know that we probably ate them at least four times a year, primarily during road trips to our 5 hour drive to Indiana to visit relatives. I’ll admit that it was a great part of the trip. You know that classic White Castle drive through (my dad would typically go in to order to stretch) that you don’t really see that often (WHY IS THAT? ), and it would be as though you could smell those sliders from a mile away. My dad would come back with a large sack of sliders and you could see the excitement on his face as well. I wish I could have remembered how many he would order, but it was a lot. It was years ago when I thought I would bring home, or at least attempt to bring home, that excitement to my kids. I will admit that the excitement was not all there years ago. You know if you are like me you stop and gaze in that frozen aisle section as to what is offered in terms of those ‘snacks’ and as I rarely pick up something besides frozen pretzels (another thing I grew up on), I decided to pick up some frozen White Castle sliders and see if my kids would enjoy them as much as I did. Please note frozen are not better than fresh. The result was expected. One kid loved them, the other not so much as it had cheese on it. Yes, I do have picky eater to this date. That’s when I took matter into my own hands and recall my sister-in-law making meals for my family when I was in the hospital. I recall my wife talking about these sliders she made and I believe they were on sheet tray. 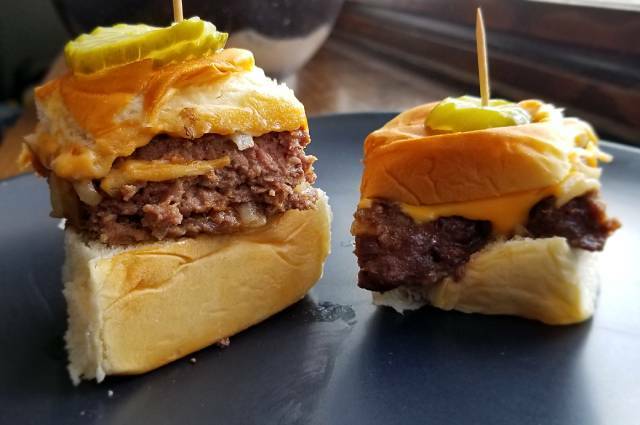 This is what sparked the idea of going sheet pan style sliders on these babies. These are way too easy to make, yield about 20 sandwiches and are a great snack, lunch or dinner idea. Let’s get started. One of those memories of those White Castle sliders was the smell of onions. It was as though you could smell through 15 feet away, being inside the car, watching your Dad carry the bag(s) of sliders to the car with a grin on his face. You know the man was excited! As you notice from what was created, there are plenty of onions in this recipe as well as that classic Lipton Onion soup mix (which took me forever to locate), and a hint of peanut butter. Why the peanut butter (besides the fact that I love peanut butter on a burger)? It brings this richness and umami to the burger that is a really subtle but great surprise. If you are allergic to nuts, by all means this can live without it. Start my making your meat mixture. Add the ground chuck to a large mixing bowl. Season with salt, pepper, and Lipton soup mix. To an additional bowl add the peanut butter, egg, and milk and mix until nice and smooth. To a smaller bowl add in the diced bread. Spoon in enough of the milk mixture onto the bread just until it softens up. Try not to over soak the bread as you really just want to moisten it, like a panade (trick to getting some nice moistness). Add the milk mixture to the beef along with the bread. Mix really well . Take a large sheet pan and line it with parchment paper. Have I told you how much I love parchment paper? Super easy cleanup. Anyway, if you don’t have parchment paper, no worries, just flatten the ground meat mixture onto the sheet pan. Go as even and as flat as you can. Remember, White Castle sliders. They will shrink and rise a bit, so no worries, but try and get to the height, if not lower than the height of the sheet tray. Place in the preheated oven for 10 minutes, then remove from the oven. After 10 minutes, remove the pan from the oven and carefully tilt and pour off any fat. There will be fat due to the chuck. Take all of the onions and completely coat the meat. Place back in the oven and cook for 15 minutes. Remove from the oven after 15 minutes, then cover the meat and onion mixture with the American cheese slices. Place back in the oven for about 5 minutes or until the cheese begins to melt. 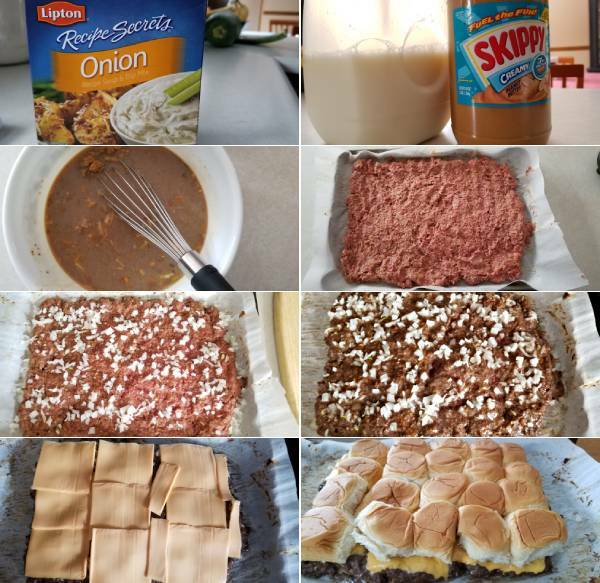 Remove the pan from the oven, then take all of the top slider buns and place on top of the meat mixture. You can separate the buns and cut later, or separate the buns ahead of time and go that route. Whatever works for you. Place back in the oven for a few minutes, just to warm and steam the buns through. Those Kings Hawaiian buns are soft to begin with so warming them up makes them just extra special. Remove them after a few minutes, then using a pizza cutter, slice into columns and rows to meet the seams of the buns and use a spatula to slide each one onto a bottom bun. Plate and serve with your favorite pickles, chips, fries, whatever. The end result is an ultra soft burger, loaded with great onion flavor. As these stacked a bit higher than I wanted, heck I would take these over the original and I think my kid (and wife) would agree. You can easily smash these down and be done in a few bites. The real problem though is knowing when to stop. I was good for three of them, as was my kid. These freeze well as well for after school snack, or late night eat if you go that route. Once cooled, place in a freezer safe storage bag and when you are ready to serve, take one or three out, place in a microwave for a minute or so completely warmed through, and get your snack on! Hope you enjoy. Were you a fan of the White Castle slider, or did you have a ‘special stop’ along the way on your usual road trip? Add the milk mixture to the beef along with the bread. Mix really well.